Sucralose is an artificial sweetener and sugar substitute. Sucralose is about 320 to 1,000 times sweeter than sucrose, three times as sweet as aspartame, twice as sweet as sodium saccharin and three times as sweet as acesulfame potassium. Owing to its stability, safety and free-calorie, sucralose is often uesd in dairy, cereals, deserts, beverages, ect. Here are market analysis about global imp & exp of sucralose in recent years. In 2015, the import of Compounds containing an unfused furan ring (whether or not hydrogenated) in the structure(HS293219) reached 22.28 million kilograms in 114 countries and regions; USA, India, Spain became the top 3 importers. In the same year, the export volume of Compounds containing an unfused furan ring (whether or not hydrogenated) in the structure(HS293219) reached 16.06 million kilograms in 60 countries and regions; China, USA, Singapore were the top 3 exporters, counting for 71.64% of global total export. In 2017, sucralose has its own HS code, 2932140000. 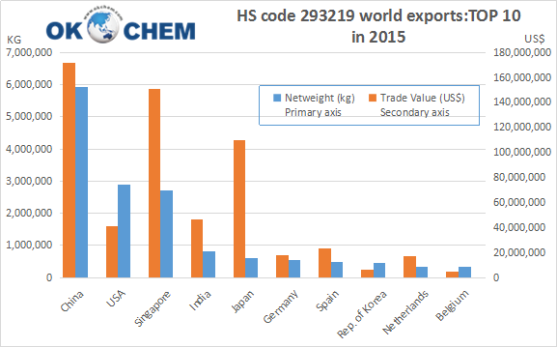 From the above figures, we can find that China is the top 1 exporter of HS code 293219, taking 36.82% of global export, followed by USA with 18.01% and Singapore with 16.81%. In 2017, sucralose’s new HS code 2932140000 carries out. 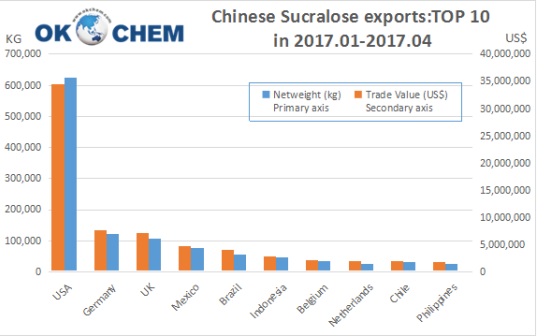 According to statistics from Globalwits (2017), China exported majority amount of sucralose to USA, Germany, UK, Mexico, Brazil, Indonesia, ect, in Jan. to Apr. of 2017. 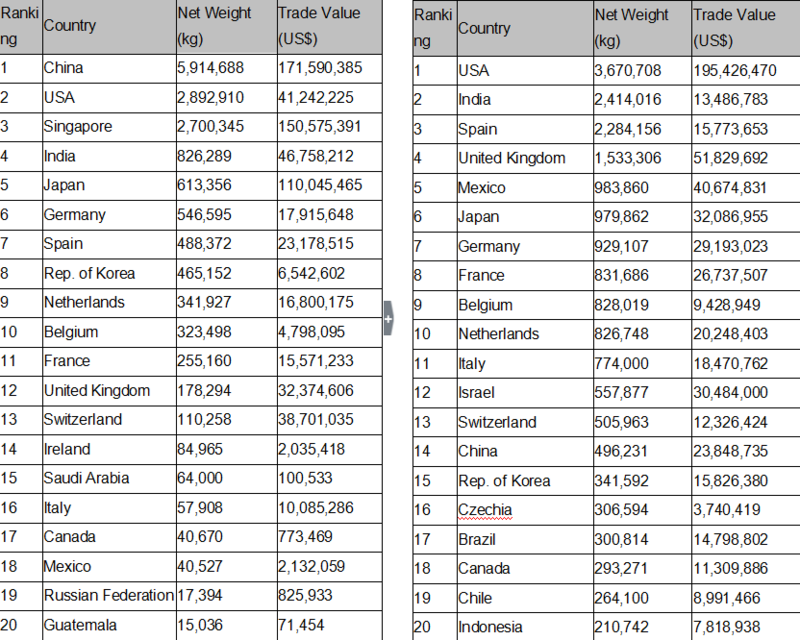 USA still ranks first with 62.5 tonnes, its import volume from China is 5 times bigger than Germany. 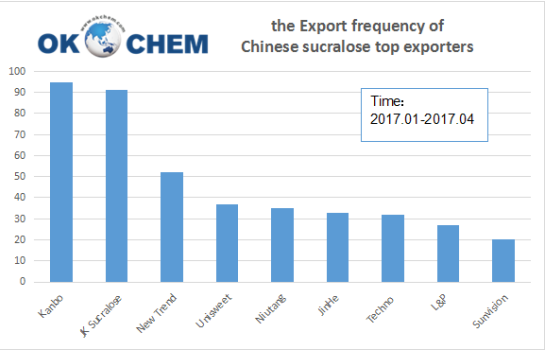 According to statistics from Globalwits (2017), we can find that Kanbo has been the top 1 exporter of sucralose in 2017.01-04, recorded 95. Kanbo is followed by JK Sucralose, recorded 93. JK Sucralose is the largest sucralose manufacturer in China, but their production has been limited because of environmental problem in 2016. Owing to the limited production of Tate & Lyle and JK Sucralose, the price of sucralose has been on a high level since the end of 2016. Tate & Lyle is a British-based multinational food ingredients provider. It’s well-known as the the first manufacturer to produce sucralose in the world on an industrial scale. In the last financial year, sales of Tate & Lyle increased 17 percent to £2.75 billion (US$3.57 billion). It is also reported a £30m (US$39 million) increase in Sucralose profit, a £19m (US$24.6 million) decrease in Food Systems profit, with significant decline in Europe and a 22 percent increase in sales from New Products. Because of over-supply and other problem, Tate & Lyle has re-structuring its Splenda Sucralose business to further focus on and strengthen Speciality Food Ingredients. In Apr. 2016, Tate & Lyle closed the Singapore facility, and consolidated all Splenda Sucralose production into one facility in Alabama, US. JK Sucralose is the largest sucralose manufacturer in China, and only second to Tate & Lyle in the world. In 2009, JK Sucralose intervened in the ITC investigation, and successfully won the ITC Case Against Tate & Lyle’s Asserted Patents. After that, with several of its own Sucralose processing patents in the United State and China, JK Sucralose has taken great advantage in the field of sweeteners. However, in 2016, the production JK Sucralose has been limited because of environmental problem. OKCHEM is an innovative, professional, and reliable chemical B2B platform, dedicated to providing convenient and safe chemical trade and one-stop solution to chemical suppliers and buyers globally, and increasing the value of international chemical trade.